Wind energy exhibition by EXPO21XX presents international manufacturers and suppliers of the wind energy industry. The Haliade 150-6MW is a three-bladed upwind wind turbine operating atvariable speed with a 150m diameter rotor and a rated power of 6MW. The turbine has been designed following Class I-B specifications of the standards IEC-61400-1 / IEC-61400-3. It is suitable for sites with a reference wind speed of 50m/s (10 minute average) and a 50 year extreme gust speed of 70m/s (3 second average). The Haliade 150-6MW is equipped with a direct-drive permanent magnet generator and three identical full power converters operating at 900V. This voltage can then be increased by means of a transformer included in the turbine. The inverter, transformer, switchgear and low voltage electrical distribution cabinet are located at the tower base. A distribution cabinet in the nacelle supplies the pitch, the yaw and the cooling fans and collects signals from the sensors. 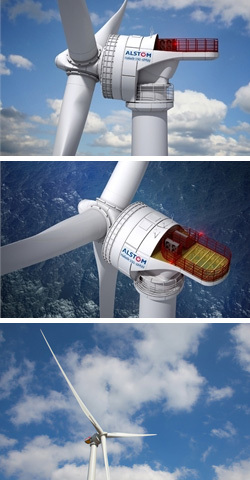 The entire wind turbine is air-cooled and pressurised. Construction materials and protection treatments are specifically designed for offshore environments. Heat exchangers and pressuring units prevent salty air entering while dehumidifiers prevent corrosion of components inside the wind turbine. How to build a wind turbine blade. The direct drive turbine offers exceptional reliability and efficiency.